Yoosaf “Abe” Abraham receiving his award at the banquet. 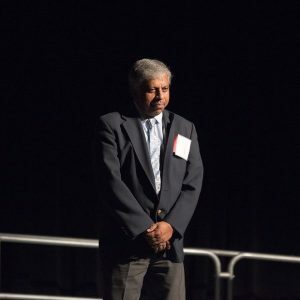 Yoosaf “Abe” Abraham, CCK Chief Operating Officer, was honored at the annual Health Care Hero Event hosted by the Wichita Business Journals on August 3rd at the Hyatt Regency of Wichita for Administrative Excellence. The Business Journals is the industry leader covering business news from a local, regional and national perspective, reaching more than 13 million affluent business decision makers via their websites, mobile, publications and industry events. Each year, the Health Care Hero awards are given to individuals for their contributions to improving health care in Wichita and surrounding areas. As a part of the award, WBJ honors individuals whose achievements in administrative excellence at a health care institution are exemplary. Abe has been a part of the leadership team here at CCK for over 20 years. He has since then earned great respect from healthcare professionals throughout the country, giving him irreplaceable knowledge and relationships among many in the industry. We are so proud to have such a well-deserving individual as part of our leadership team here at CCK.